$8.49 & FREE Shipping on orders over $59. An easy, sanitary way to take samples! No need to start a siphon with this Sample Taker - simply lower it into your carboy and it fills automatically! You just insert your hydrometer to take your reading. Using a turkey baster, currently. Tired of spilling precious wort trying to fill a flask to take hydrometer readings. This thing works fine except the fluid being tested will occasionally drip out. That's OK if you will be making your test over your container. If not you will need to hold your hand under it to avoid making a mess. The plastic walls are very clear so it is easy to read the brix. Handy as a thief, , but leaks quite a bit. Need another container to test in. As mentioned in other reviews, it is not a perfect seal on the bottom. I tried to use the hydrometer in the sample taker, but it requires a little too much effort in my opinion. I take the sample and fill my 100ml test tube. I normally just do one sample when I am confident fermentation is over so this works fine and allows a taste test as well. If you wanted to do samples during fermentation, it is nice in that you can float the hydrometer in a very small sample size, you just have to be willing to wait for the foam to settle and to balance just right so it floats as there isn't much clearance. 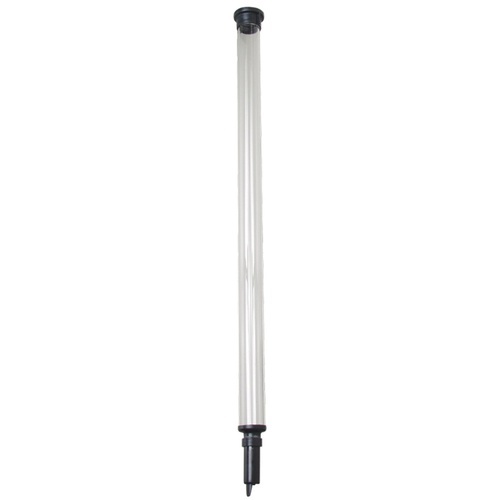 Uses much less volume to take a hydrometer reading than in a standard tube. Has to be held perfectly level to keep the hydrometer from touching the side however it's quite simple. I do also get a few drips from leakage but I have no complaints over a few drops. For me this product is a necessity and makes the process easier. much better than designs that come apart for cleaning. I dont find that it leaks at all. Very satisfied. I haave not had any issues with mine and I use it a lot! You will be glad you made the purchase! I always use this to take OG and FG readings. I have never tried to drop the hydrometer right into the sample taker tube. I always empty the sample into a hydrometer test jar. It works great! As others have mentioned, it does tend to leak. I've started to use the thief to pull wort and dump into another container where I can take a hydrometer reading. Effective, but has small leak. It completely works, but anticipate a few drips. Works with a standard hydrometer. This does what it's supposed to, but expect significant leakage. I mostly use it for taking samples, after the krausen has fallen, to get a feeling for whether fermentation is done. Sometimes it dribbles, but since I'm immediately transferring to a cup for taste testing and taking a refractometer reading, it works perfectly well. I have two, one for sours and one for "clean" beers. It makes sampling much easier, but it does leak from the bottom quite a bit. Just hold it over your sanitizer bucket when taking a hydrometer reading and its fine. I like the item, but it leaks a bit. This is a general rule for this type of item, not just this particular brand. I drop in the hydrometer with a spin, and gravity readings can be taken from one dip. Just be quick, and hold it over a catch basin of some sort, to collect any drips or spills. I used this for my wine but I really had to push hard on the tip to get it to flow faster. When you pull it out and it has liquid inside it drips more than I would like. Wish I could just drop the hydrometer into it. Can't. I use this a lot to sample both beers and wines to monitor progress. Easy to clean and use so I don't have to waste product to monitor gravities. This product works well and is designed fairly well. It does leak a tiny bit which is annoying but it gets the job done. I have never tried to drop the hydrometer into it but I take samples when needed. I am glad that I purchased this product. Way easier than using a thief when you want to take a gravity measurement. Works great with carboys and buckets and does not waste much beer in the process. I use this all the time to take samples for tasting, it does have a bit of leak but not like you will be running around with this full to fill everyone's glass. I have used to try and take hydrometer readings but found using a 1/2 inch Racking cane housing works better, you have a bit more room. Yes, it works as a thief, but as has already been stated, it leaks quite a bit. I've also found it difficult to get a good reading from the hydrometer due to the hydrometer sticking to the sides of the sample taker. And you have to get that reading fast since it is constantly leaking away. For the effort involved you're better off using a standard theif, filling your sample jar and going from there. Or using a refractometer. I'm not totally turned off on the idea, just not this particular unit. I agree with Dave, this works great as a thief, and in theory it does work for hydro readings, but you really have to have steady hands and patience, to get it perfectly plumb and level, so that the hydro rests directly in the center and doesn't touch the sides. make sampling easy and is very easy to use. I picked this thief up to enjoy the convenience of simply dropping my hydrometer in after taking a sample. It works fine as a thief but it leaks a good bit and the hydrometer tends to stick to the sides, leading to an inaccurate reading. If you wanted to give the hydrometer a spin, enough probably leaked out that you can't reach in to do so. Instead, I just use the tube the hydrometer came in to empty the sample and test.